OHB chooses AUCOTEC system for harness area. Andreas Lindenthal, Management Board member of OHB System AG, said: „We need absolutely reliable and consistent data at all times for each user. 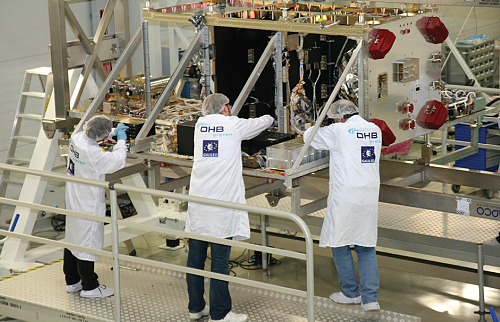 The new system, which we use exclusively in the entire harness area, is ideally equipped to meet this need with its central database.“All wiring harness details of a satellite project, whether airworthy or test cable, are stored in EB‘s data model. In multi-user mode, it is possible to work at various points in the process in the same project; users see their colleagues‘ results immediately, regardless of where they work. This avoids discussions, multiple entries and errors. Mass data – an everyday challenge with 15,000-20,000 pinto-pin connections to several 100-pin connectors per satellite – can be easily managed using purely alphanumerical editable Excel-like spreadsheets. The results are immediately displayed automatically in the corresponding graphics also. According to OHB, EB is characterised as much by automated test runs as well as easy exchange with subcontractors or downstream applications, for example, 3D and PLM, as by the Windows-like approach, which makes the system easy to learn. Initial projects have already been implemented at the two OHB sites in Bremen and Munich. AUCOTEC very competently assisted in the adaptation of EB to specific OHB requirements for these projects. Later the scope of application of the platform shall expand according to Andreas Lindenthal. Furthermore, there is already a plan to harmonize the engineering processes of OHB and the company which was integrated some time ago, Kayser Threde.